I just got round to registering with a local doctor, five years after I left the area where I was previously registered. I know this is bad. I mean it's good to put it right, but it's bad that it's taken me this long. About a year of that time I was on the road, but still. I think I made a move towards it when I was living in Chesson Road, but I think that move was "pick up the forms from the surgery". I don't think it went any further. I'm not ill. I feel good, but clearly something has shifted, since today was the fifth day in a row that I walked more than five miles and now I'm willing to register and probably go in for a check-up. I am fortunate, I have not had any serious illnesses or injuries, I have never spent a night in hospital. I've had a couple of visits to A&E after carelessness on the stairs, oh and the times I dislocated my shoulders at college. I'm not a heavy user of the NHS. And so the medical questionnaire was straightforward. I needed to disclose that my dad had an aortic valve replacement a couple of years ago at age 74. Given the heritability of that condition, I suppose it would be sensible to have my heart checked and as I approach 50, I think they encourage you to have a range of checks regularly. Part of me says "well if you go looking for stuff, you're likely to find it". But I think it's better self-care to have checks rather than self-diagnosing every twinge and soreness, every bit of life that could be a symptom of something horrible. It did help that I could do it all by filling in two online forms (although I rolled my eyes a bit when I had to repeat information in the second one). It seems that my phone says it's back at home every now and then. It's odd, there aren't any devices turned on here that are sharing location, unless there's something weird cached in the router? Anyway I learned a lesson today - don't try to walk through busy areas like North End Road and be prepared to cut your walk short if a thunderstorm starts shortly after you leave home. So I didn't get my usual pause at 45 minutes, I had to keep walking and then had to get a bus because the rain was so bad. Apart from the bit from Redcliffe Gardens to Imperial Wharf, I was up on my feet. I've taken a long walk three days in a row now. I don't want to make predictions or commitments about how long I'll do this, but I'm enjoying it and I plan to do it tomorrow. That's all I can say. It started on Saturday when I was feeling a bit down and sorry for myself. I'd spent some time earlier in the week at Longbridge and I was pining for the hills and woods of The Lickeys. I was thinking that I needed to get back there and spend some time in a place where I could just decide to go off for a walk across fields or woods any time I liked. And I looked out the window and realised what a buffoon I was being. I set out first to see whether I could walk to Wimbledon Common from home. Of course I could, but it's about 3 miles across suburban housing estates and main roads. Nonetheless it was tremendous to find myself there after about an hour or so of walking (slowed a little by several showers of heavy rain). I had a wander around the woods, walked down muddy tracks, came out by the Windmill but had had enough walking by then and so went to get the bus. I rode down to Putney and had a cuppa in the High Street and then walked home. It felt good. So yesterday I'd thought a little and decided it might be fun to see how far I could walk in 45 minutes from here. I thought that I should be able to do a five mile round trip, so 2.5 miles in 45 minutes (at my gentle 3-4 mph shamble). I should say that this isn't meant as a get fit quick regime, the motivation is more for me to simply be using my body rather than sitting here clicking on tabs. I know that my brain works better when my body is working more and that trying to make a distinction between the two is silly 18th Century reductionism anyway. No, 2.5 miles felt comfortable. So I had a look at the map and drew a 2.5 mile radius around here. 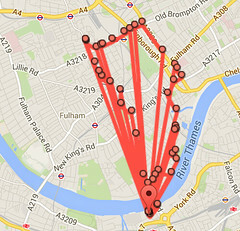 Turns out that, as the crow flies anyway, the south side of Chelsea Bridge is about 2.5 miles from here. I reckoned that with some of the twists and turns of the route between here and the bridge, it would probably add up to 2.5 and it seems about right. It's not so much about the distance as where I get to and what I can see within 45 minutes gentle walk of here. I set off and set a timer for 45 minutes and just forgot about distance and time and walked along the river path downstream to the east. It was very windy and quite cloudy. I expected a shower or two, but they never really came till I was almost home on the way back. I found that the path is open now between Battersea Bridge and Albert Bridge (there was a while when it was closed because construction) so apart from having to cross the roads and the little detours around the heliport and the railway bridge, I was next to the very choppy river all the way. In the end I made it to just about half way between the Peace Pagoda in Battersea Park and Chelsea Bridge. I was disappointed to find that I'd come out without more than £1.50 in cash and so couldn't have a nice cup of tea before turning back. So I sat under the pagoda and made some notes and then plodded back along the same route that I'd come. This is new for me - I usually try to do circular walks, but I like, for now, the idea of just going there and back again and knowing that it will take me the same time as it took to get there. Today, I headed south. I took Trinity Road, again for 45 minutes, and made it as far as Tooting Bec station. On the way, I remembered just how much woodland there is in Wandsworth Common (really not far) although it's a bit weird wandering around in the woods during the day, I got the impression that perhaps some of the other middle-aged men hanging around there on their own weren't just there for the fresh air... Anyway another good walk, I feel fresh and inspired, lots of ideas come while I'm moving and today I'd made sure I'd got some change with me so that I could get a nice coffee and have a sit and a think at the half way point. I fiddled with making a podcast while I was walking but I couldn't really think straight while I was walking an unfamiliar route with people around. Perhaps I need to practice. I'd like to get back into a regular solo podcast routine. Tomorrow, I plan to head North (ish) into Fulham and West Ken. I should be able to get beyond Earls Court easily. [My walk today.] Google/my phone thinks I crossed the river several times. "From 1918 to 1924, [Austin] served as Conservative Member of Parliament (MP) for Birmingham King's Norton but never made a speech in the House of Commons." - Wikipedia on Herbert Austin. By Lloyd Davis, Thursday, May 1, 2014 at 10:23 AM.